Work and migraines do not go together very well. Many of the triggers commonly associated with migraine are often present in the workplace. Presenteeism, or working while sick, can result in loss of productivity. Finding the best ways to manage the obstacles migraine can bring to the workplace can help improve productivity. Asking for a few accommodations at work will help make working with migraine less stressful on you and your employer and reduce the negative effects of presenteeism. Below are a few ways to help manage a migraine at work. Fluorescent lighting is commonly used in offices. This harsh lighting emits harmful wavelengths which can trigger a migraine. 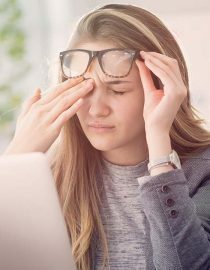 Fluorescent light causes eyestrain due to the glare and can disrupt sleep patterns. Light filters can be used to reduce the effects fluorescent lights have on the body and help improve your productivity. Using filters are cost-effective as they reduce the number of fluorescent bulbs needed and are easy to install. The natural light emitted through the filters also helps with mood, so it’s great for anyone who may also have depression or seasonal affective disorder (SAD). If your employer is not willing to invest in light filters or if you work outdoors, there are other options. Precision tinted eyewear is made specifically for people with light sensitivity or photophobia. Photophobia can be experienced without any head pain present. The specific tint used, FL-41, is a rose-colored tint which filters out the painful wavelengths emitted by fluorescent lighting and sunlight. They relieve eye strain, light sensitivity, and pain associated with harsh lighting. This eyewear can be purchased for indoor and/or outdoor use, making it perfect for transitioning from fluorescent light to sunlight. You can have a pair just for the office and one to wear when you are outdoors. Dehydration is another common trigger for migraine. Making sure that you get your water intake at work is going to help reduce the risk of dehydration triggered attacks. You should be drinking your body weight in ounces each day. For instance, if you weigh 130 pounds, then you should be drinking 130 ounces or 16 glasses of water per day. Bring a refillable water bottle with you to work and ask to have your desk close to the water cooler. That way you won’t have far to walk, and you will have a constant reminder to drink water at work. It is also helpful for when you need to take any oral medication if an attack arises. The last thing you want to deal with is a long walk to the water cooler. Sometimes you will find yourself with a migraine at work or an attack coming on and need to find a dark and quiet space where you can take your medication and relax for 20 or 30 minutes. Let your employer know (if you feel comfortable enough to disclose your condition) that from time to time, you may need to do this to abort a migraine. If you have your own office, you can make a sign to hang on your door when you are having an attack so that your coworkers know not to disturb you. Or if you work in a cubicle or open area, ask your employer if they are willing to accommodate you during an attack and provide a small quiet room for you to use. Keep an eye mask and a pair of earplugs in your desk to drown out any loud noises and light. If your office has a sofa or couch, you can lie down and rest. Or if not, try propping your legs up on your desk with a small travel pillow under your feet and one under your head for comfort. Doing these things could help your medication work more efficiently allowing you to return to your work duties. Make an appointment with your Human Resources benefits manager to discuss your company’s policy on taking family and medical leave. Some employers now offer paid family and medical leave, so look into whether yours does. The application requires your physician to complete a portion regarding your condition, the reason(s) why you would need to use family leave and how many hours a week or month you need to use it. Reasons could include but are not limited to appointments, treatments and if you may need to use it for severe attacks that will keep you from coming into work. Knowing that you have protected leave that can be used specifically for your medical condition without retribution from your employer is a huge stress-reliever. Telework is working from home using the internet, email, and telephone to conduct business. Telework is becoming increasingly popular among employers as it helps to keep productivity up among their employees. This is a great option, if offered, to people who have a migraine. Being able to work from home will help to reduce presenteeism. You can split your work week up and work some days in the office and others at home or only elect to telework when you are unable to drive into work when you aren’t feeling well. Create a schedule you and your employer are happy with that benefits both parties. A migraine survival kit is something you can pack up and keep in your purse or vehicle or work at all times, so, when a migraine strikes, you’re prepared. Do migraines cause you to take time off from work?